Assistant Professor of Anthropology Hugo De Burgos has been named one of Canada’s 10 Most Influential Hispanic Canadians. Chris Alexander, minster of immigration, and Ian Troop, CEO of Toronto 2015 Pan/Parapan American Games presented the awards at a ceremony in Toronto recently. De Burgos came to Canada from El Salvador alone, as a teenager. The young immigrant found inspiration in Chilean professors at the University of Alberta, where he later received his PhD. 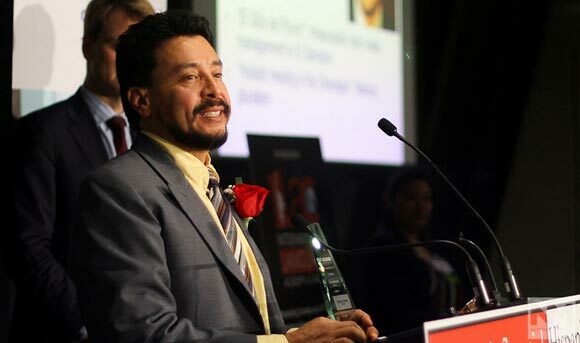 De Burgos is happy that he can be an inspiration for young Hispanics in Canada. He is an anthropologist, filmmaker, activist and assistant professor with the Irving K. Barber School of Arts and Sciences at UBC’s Okanagan campus. Since 2007, 70 Hispanics from eight provinces and 15 countries of origin have been selected as Most Influential Hispanics in Canada by media and business executives and academic leaders. The awards, organized by the Canadian Hispanic Business Alliance, recognize Hispanic Canadians who are making a positive impact on Canadian society. Congratulations Hugo - what a great honour! We are very proud of you. Congratulations Hugo! You are an inspiration to everyone. Wow! Very inspiring Dr. De Burgos!! Congratulations!